Did you know planting a tree is one of the easiest and most powerful things you can do to have a positive impact on the environment? It's true. Trees clean the air, prevent rainwater runoff, help you save energy and even combat global warming. And they're a snap to plant! No horticultural degree required. With Arbor Day just around the corner in April, there’s no better time to give Mother Nature a little TLC by planting a tree. Trees don't just absorb CO2. They also absorb odors and pollutants like nitrogen oxides, ammonia, sulfur dioxide and ozone. It’s estimated that one tree can absorb nearly 10 pounds of polluted air each year and release 260 pounds of oxygen. Gardening can be intimidating for newbies because there are so many variables. Which plants and flowers should you put next to each other and which should you separate? Which bloom in the summer and which bloom in the fall? When you’re dealing with trees, there’s none of that. Just choose a spot in your yard and you’re good to go. Here’s a video showing you all you need to know about planting your young trees: https://www.youtube.com/watch?v=d5FiqoypXfo. 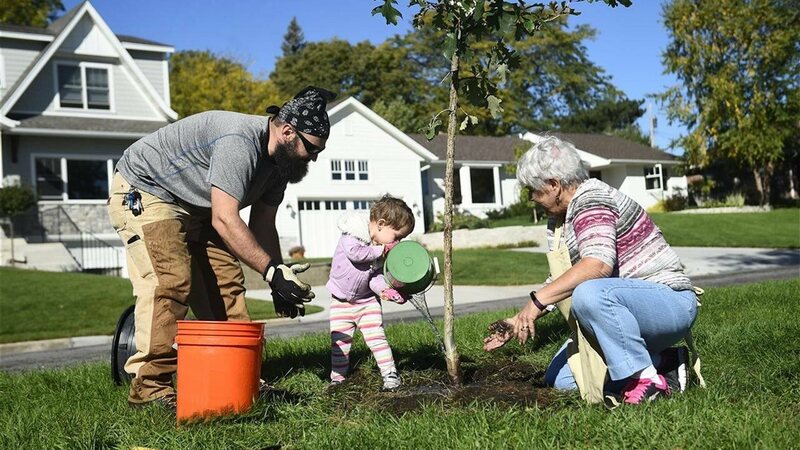 Trees can live hundreds of years, so when you plant one, you're giving a gift to your children and grandchildren. It's a symbol of your commitment to the environment and the beauty of the world around you that will live on far beyond your own lifetime. An ancient Chinese proverb states: “The best time to plant a tree was 20 years ago. The second best time is now.” To find out more about planting trees, visit the Arbor Day Foundation at www.arborday.org.